In war-ravaged Afghanistan, holding the country's first election poses stiff challenges - harsh terrain, suspect security and simply ensuring that people cast their ballots properly. 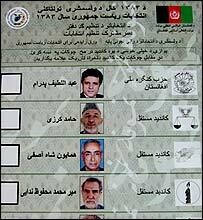 On 9 October Afghans will choose from 18 presidential candidates in some 25,000 polling stations across the country. That is not all - Afghan refugees in neighbouring countries will be also casting their ballots. Some 800,000 Afghans living in refugee camps in Iran are expected to turn up at the 1,000 polling stations on the same day. And in Pakistan, another 1.5 million are expected to vote. The election authorities are trying to keep the voting procedure simple and ensure that men and especially women - who comprise 41.3% of the electorate - come out and vote. Cartoons and posters will illustrate voting procedures to a largely illiterate population. 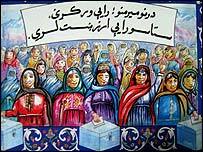 "Respectable women, give your vote because it is valuable," exhorts a colourful poster showing a group of women around ballot boxes. Officials believe that the use of cartoons and info-graphics during registration helped educate the people. The ballot papers, printed in Canada, will contain photographs, names and symbols of all the candidates to make it easier for the voters to identify their choice. Voters will mark their choice on the ballot paper with a pen - millions of pens have been ordered. There will be separate polling stations for men and women. Voters will have a thumb marked with indelible ink. A big challenge is to find enough men and women to staff voting centres in a country where literacy is low. State-run radio is spreading the word about the election, and some 1,200 "civic educators" will be going around the country to hire local polling officials. Election logistics are also a considerable challenge in the country that has few good roads. Pick-ups, four-wheel drives, jeeps, airplanes, helicopters, horses and donkeys will be used to transport polling officials and materials to all over the country. Bringing the 30,000 ballot boxes, built in Denmark, to the counting centres after the end of the voting will be another daunting exercise - an average of 3,000 ballot boxes will be moved to each centre. "There will be convoys of trucks, five MI-8 helicopters, jeeps and hired vehicles bringing ballot boxes to the polling centres," says Julian Type of the Joint Electoral Management Body. In some cases, it may take a week to bring the boxes down to the counting centres, he adds. The ballots will be gathered in the presence of national and international poll observers and candidates' agents. They will be counted in the provinces. Security fears are running high ahead of the elections. More than 20 people have died in recent violence - including an explosion in the capital, Kabul. Much of the violence is blamed on Taleban or other militants who want to disrupt the elections. At the offices of the election authorities, there are maps dividing the country into low, medium and high risk areas. "The major conflict in Afghanistan has ceased, but security remains an ongoing concern," says Julian Type. A top Europe-based election observer body has already said Afghanistan's skittish security environment would make it impossible to monitor the polls. Some 12 people were killed and another 30 injured in election-related violence over the nine months it took to register voters, the UN says. Many people were not able to register in the south and south-east because of threats by militants, officials say. International election officials, who are helping out in Afghanistan, say the situation is more serious than it was during recent elections in "post-conflict societies" like Cambodia and East Timor. The 26,000-strong US and Nato-led peacekeeping forces say they are taking measures to tighten security. But as a spokesman for the Nato-led forces said recently, "security can never be 100%". The inking of voters thumbs has also raised fears they could be targeted by militants. "The ink will last for only five days. After that time, no voter can be singled out. People have been largely supportive of the election," says Said Mohammad Azam of the Joint Electoral Management Body. How long will it take for the votes to be counted and the results declared? "This country has never experienced elections before," Mr Azam says. "The results may take two to three weeks." Some analysts say the election is being held hastily. The registration of the 1.5 million refugees in Pakistan will be completed by an international body barely a week before polling. "Nobody expects the election to be smooth. But it has to be held to give a voice to Afghan people," says analyst Kazeem Ahang of Kabul University. 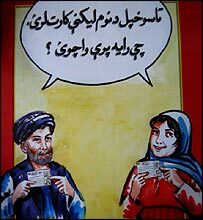 Can fair elections be held in Afghanistan?